I’m out in beautiful Oromocto, New Brunswick visiting friends for the next few days! 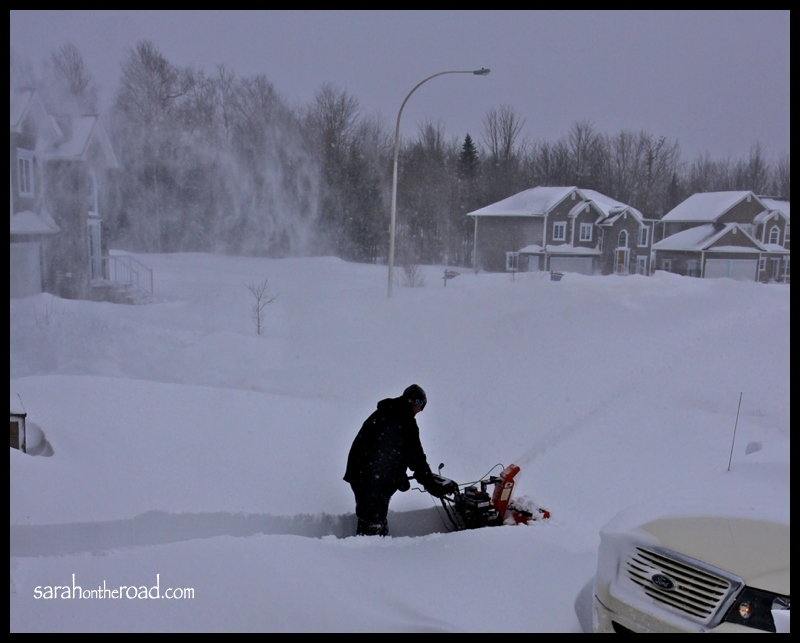 I must admit…I picked the perfect days to fly to visit friends in Oromocto, New Brunswick. I flew from Toronto on Friday..the day after a huge snow storm that brought about 30 cms of fresh snow to New Brunswick-flights were delayed and then cancelled! On Friday it was all systems go…and then Saturday was a gorgeous day. 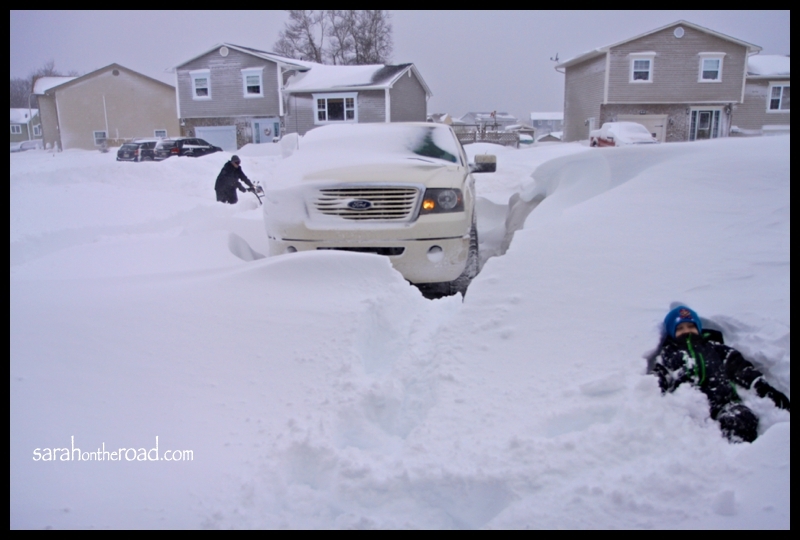 Today there was another dump of snow…so finally had some good luck and made it safely between the storms! As normal I ended up falling asleep before we took off in Toronto…and woke up just as I was landing in Fredericton. 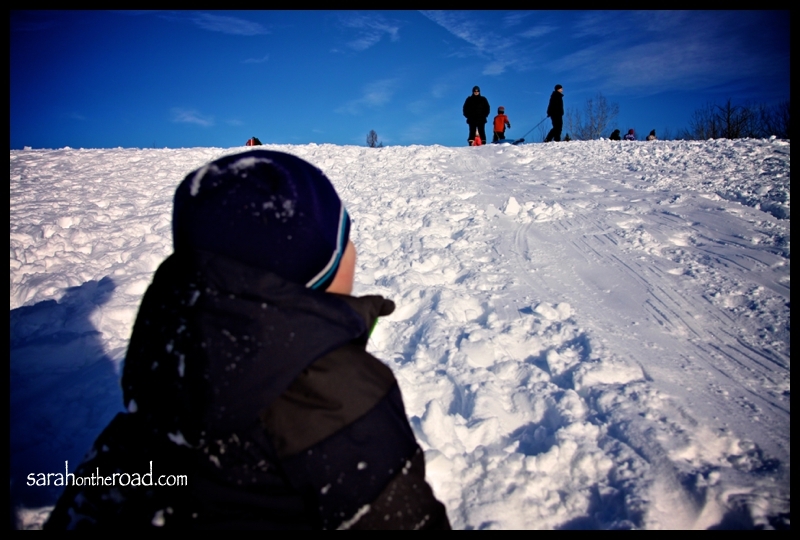 On Saturday, we bundled up the kids and headed to the hill to do some sledding! It was such a fun outing. This morning I woke up to a WINTER WONDERLAND. We got another 30 cms or so of more snow!!! 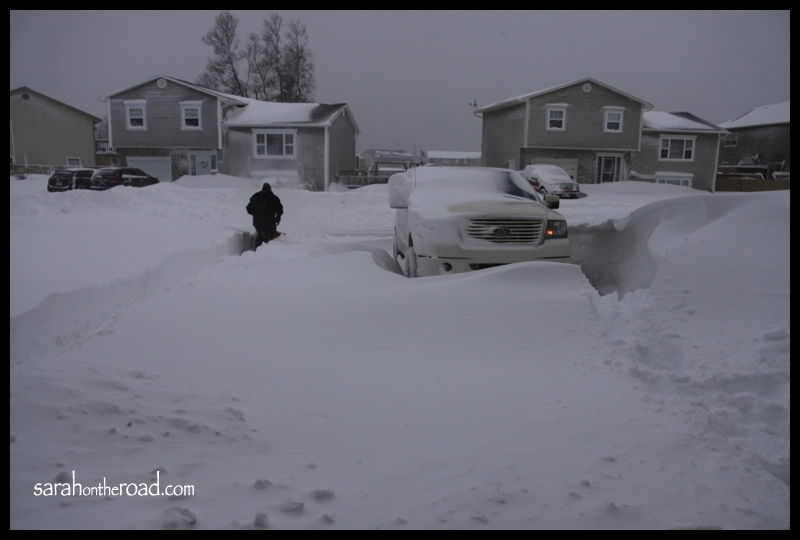 It was blowing…so there were drifts that were up past my knees in some places. 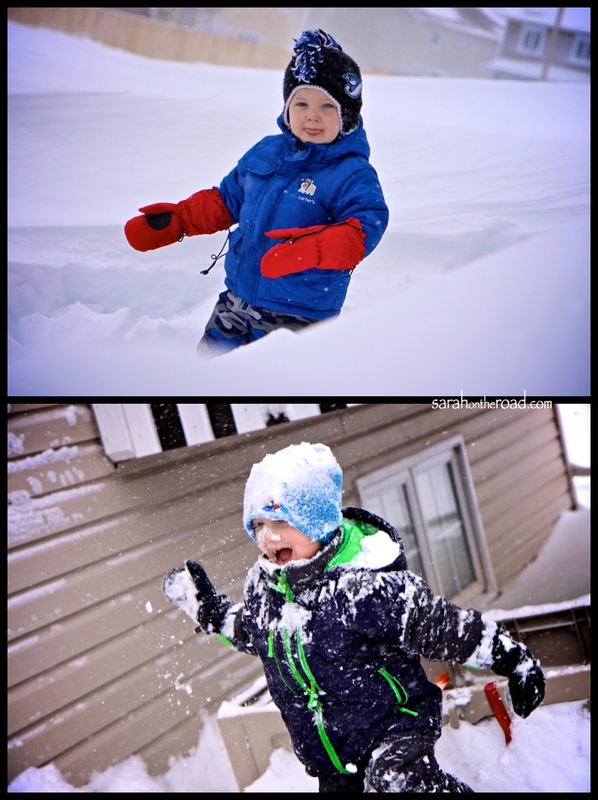 After having the most awesome breakfast/brunch… we bundled up the kids again… to go outside! Everyone’s reaction to the snow was a little bit different. 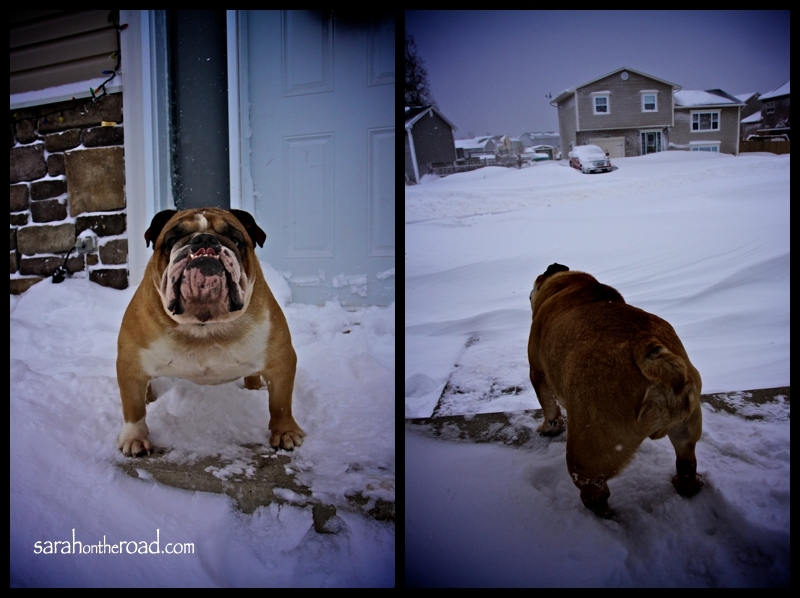 Tank wasn’t sure what to think…he definitely wasn’t going out on the lawn to do his business! The kids at first weren’t sure about the snow…but then the blowing winds and more snow, and walking around in all the extra winter clothes was a bit much for the youngest in the group. 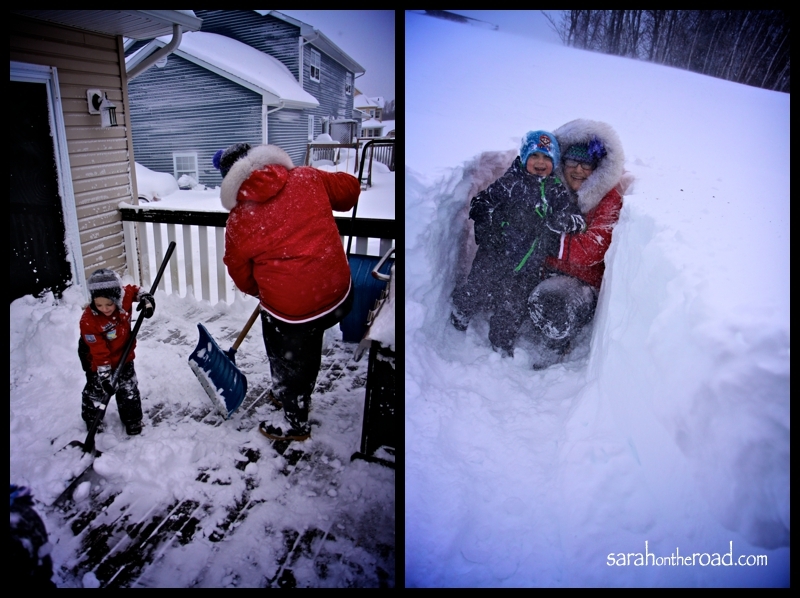 But then the older boys LOVED it… diving right in and having fun shovelling and jumping into the snow drifts! 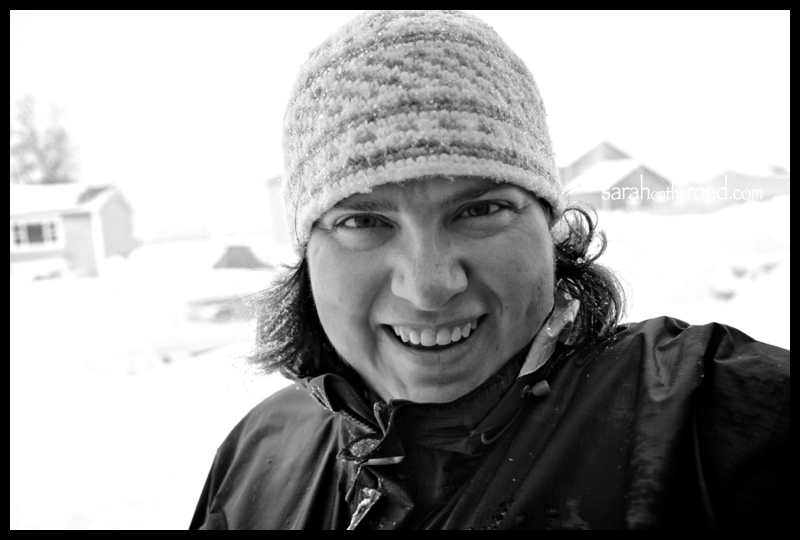 …self-portrait to show how happy I was to be out there in the snow! The rest of the days was spent playing Wii…and Hot Wheels- have you seen the Hot Wheel- wall tracks? they are way cool! And so easy to put on a wall…why didn’t they have that when I was a kid? 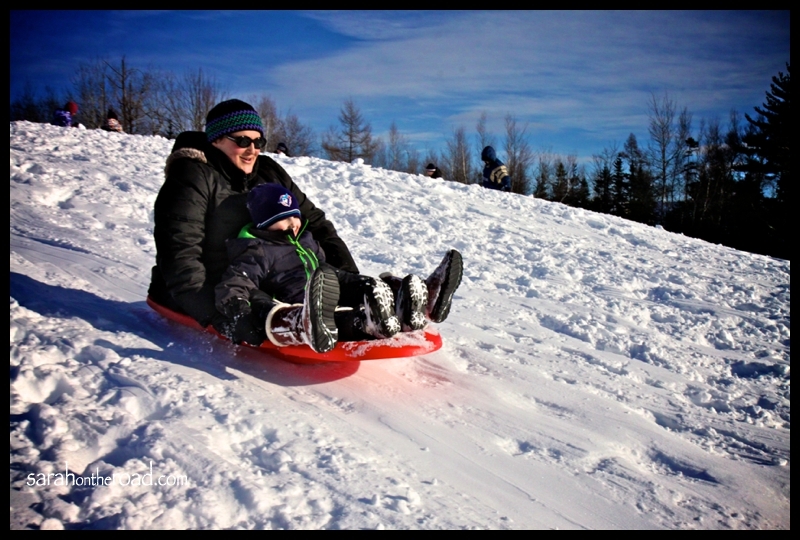 Hope you are having fun enjoying time with family and friends… what are some of your favourite memories in the snow? 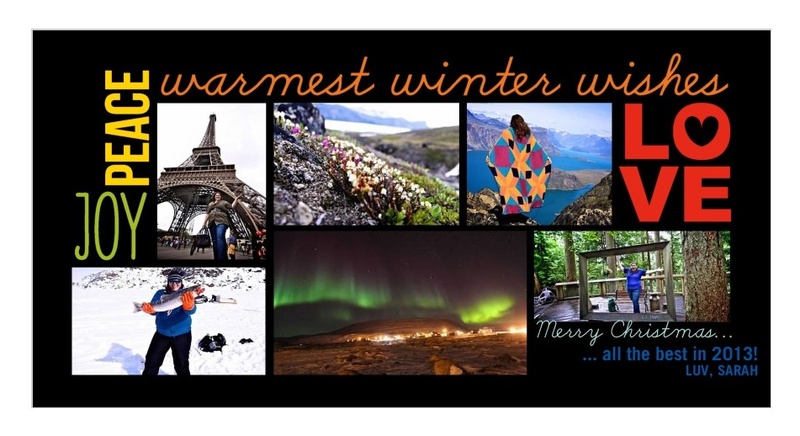 This entry was posted in Friends, Travel in Canada and tagged New Brunswick on December 30, 2012 by Sarah on the Road. 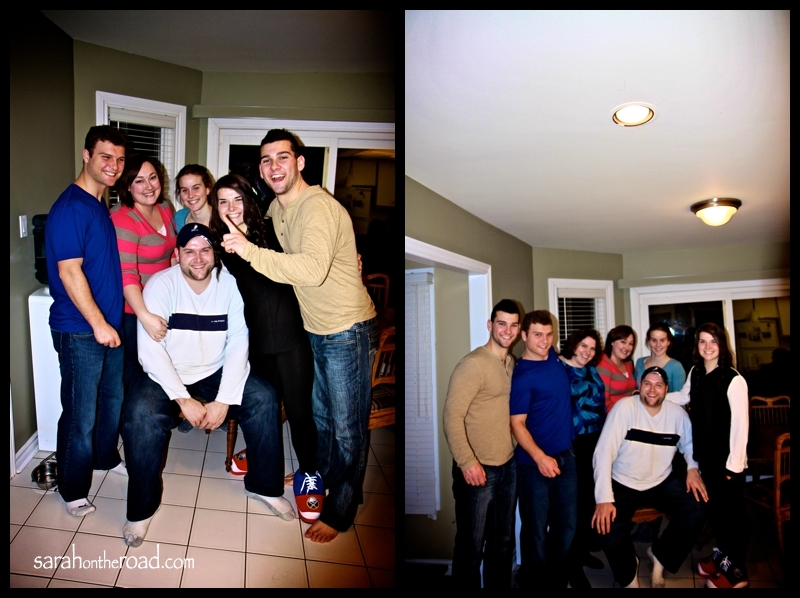 The past three days have been full on family get togethers and fun! 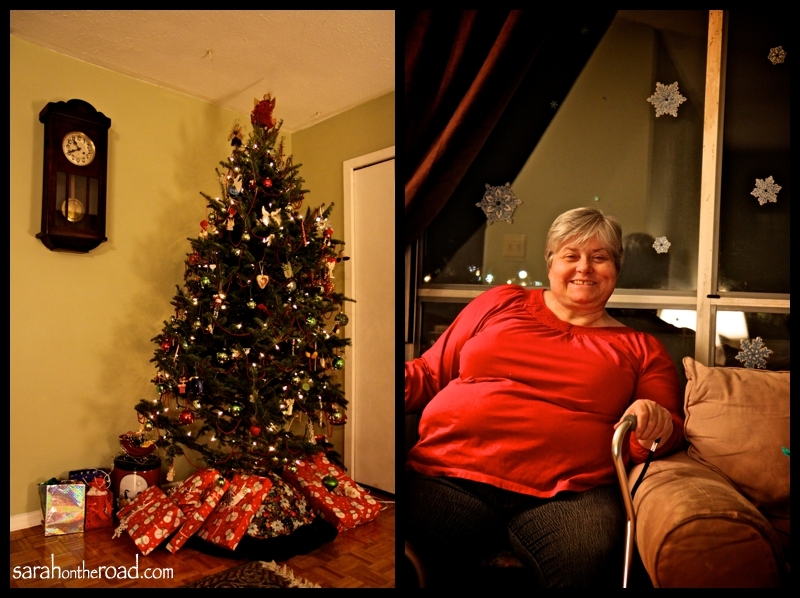 On Christmas Eve I headed to my Aunt and Uncle’s house, to celebrate a very special birthday. 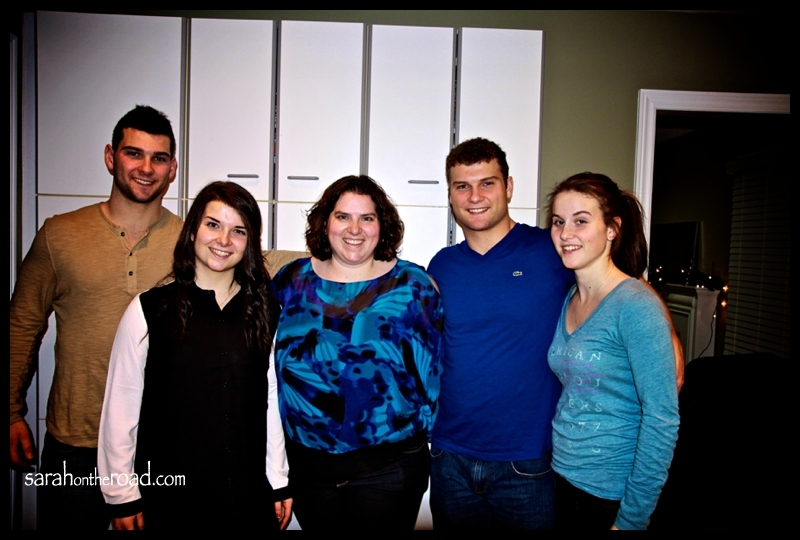 It was awesome to see my cousins…it’s rare we are all in the same spot at the same time. Thanks for the wonderful evening…it was great to see you! 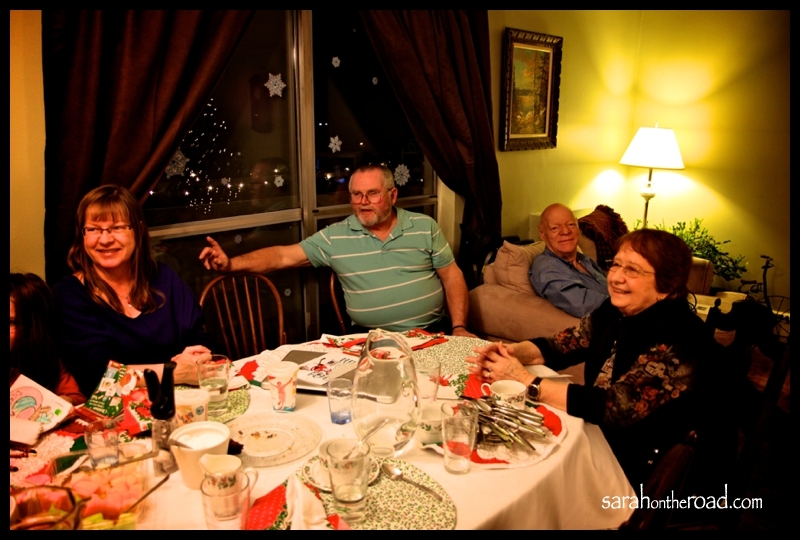 Christmas Day was so much fun! 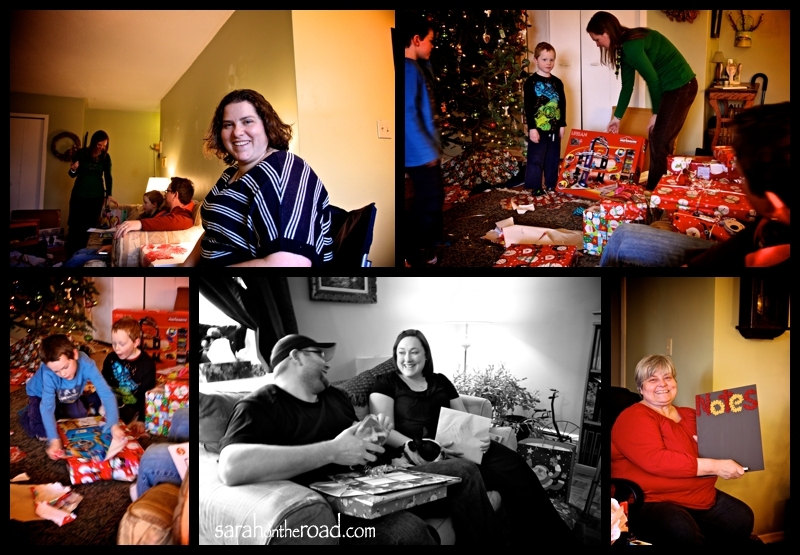 My nephews handed out all the gifts… then the craziness began. This holiday I found an awesome shop from the states, Blue Q. This online store has heaps of awesome items. I got my family some ‘piggy banks’ and some “lavatory mists”…check them out… The Cheese Cutter, Baby’s Head Smell, Fanny Rosebottom’s, Jack the Ripper and Abe Lincoln’s Log! (check out to the backs of the bottles and the descriptions…) Blue Q were so helpful in doing my order, and it came in 2 days! Dinner was awesome. It was a team effort…I stuffed the turkey and put in the oven. I pealed potatoes until I pealed off a good chunk of finger along with a potato peal. Kat and John helped with checking on the turkey and putting the casseroles in the oven, while Dana made the ‘candy’ (Squash)….then Jamie did the carving. 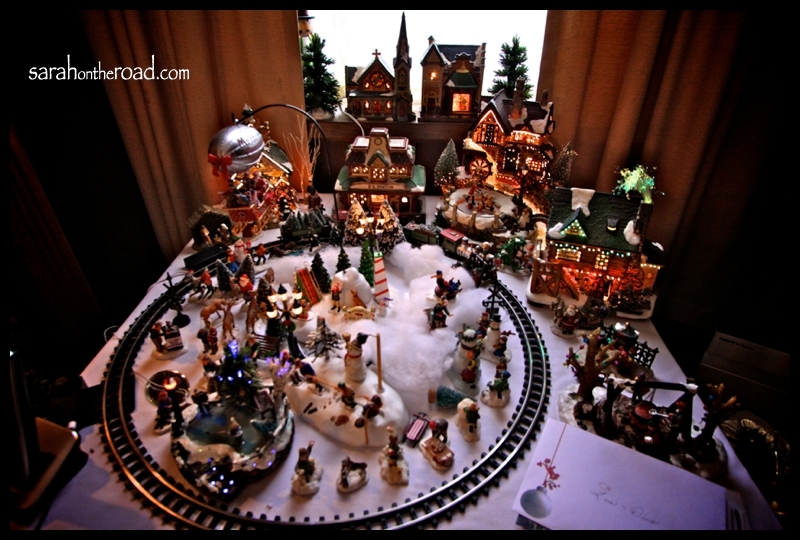 My mum was very helpful, she directed from the dining room table in all steps of the process. But it was such a fun day! 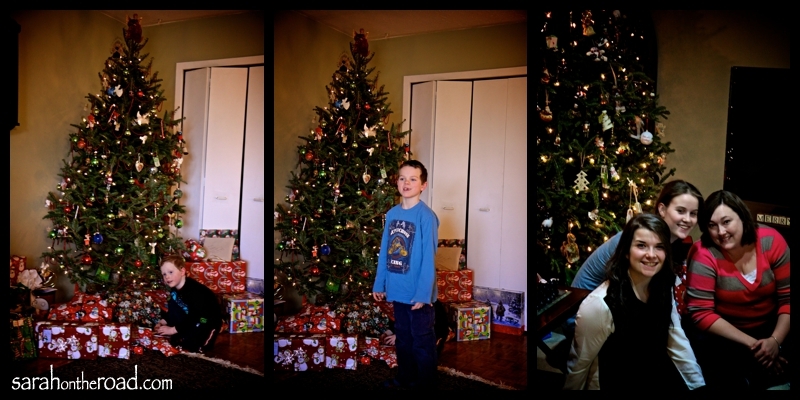 It’s been a very fun Christmas so far…and family time isn’t over yet! Currently as I type this we are starting some family trivia… it’s hilarious, I need to get in this game. Until the next time…hope you are all having a fabulous holiday filled with fun family times! 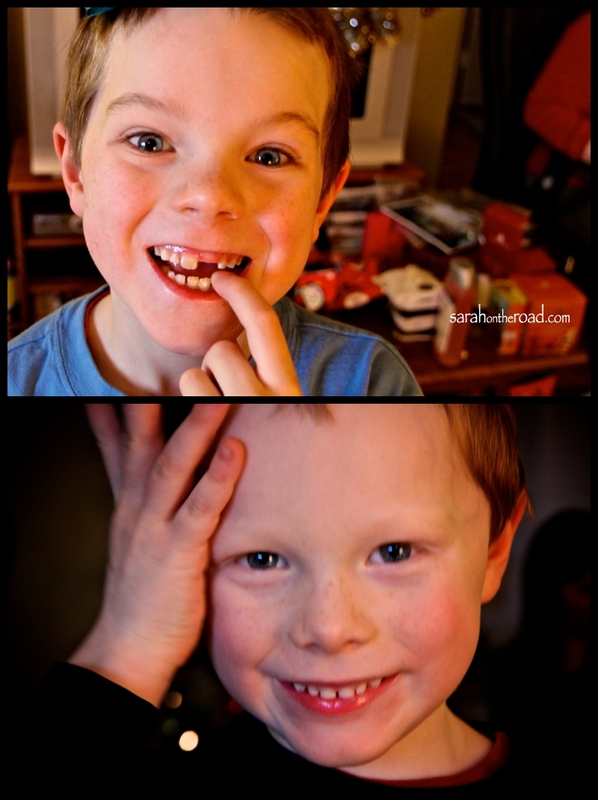 This entry was posted in Christmas, Family, Visits to Ontario on December 26, 2012 by Sarah on the Road. 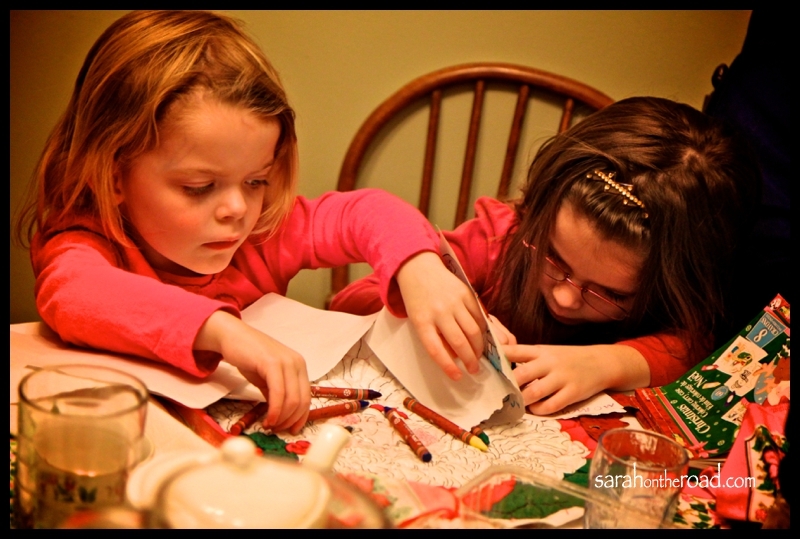 This entry was posted in Christmas and tagged Cousins on December 26, 2012 by Sarah on the Road. 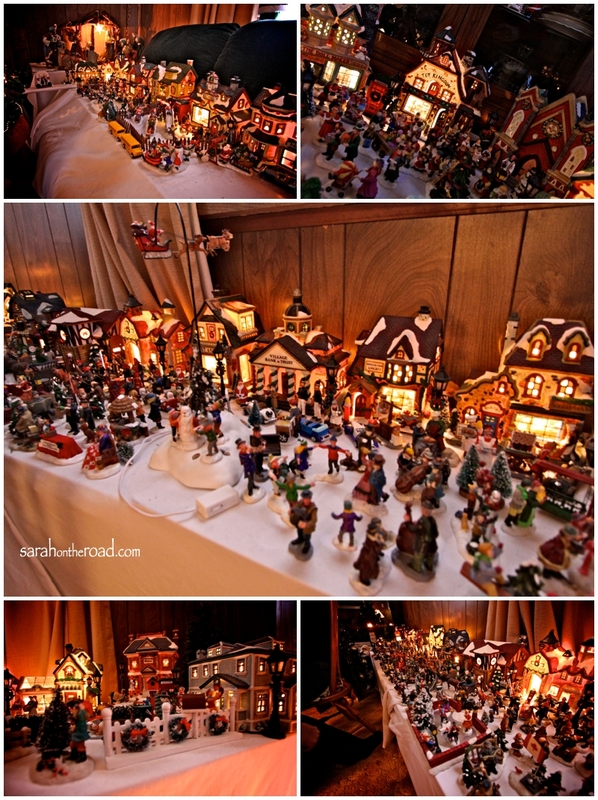 …sending you warm holiday wishes from my house to yours! Wishing you and your families a very Happy Christmas! 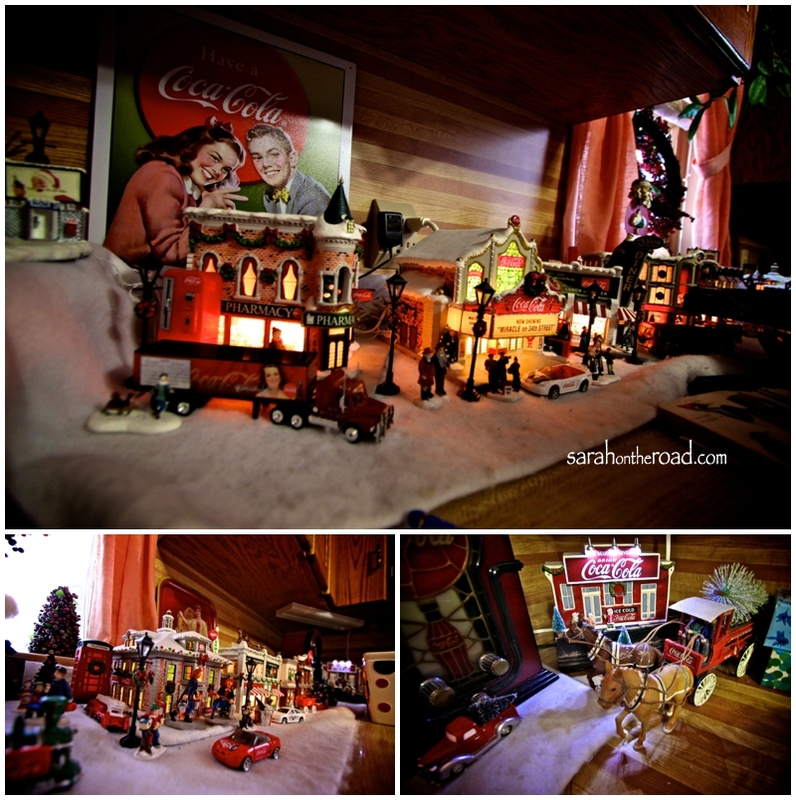 This entry was posted in Christmas on December 25, 2012 by Sarah on the Road. Here’s a summary of my last week… time flies when you are on holidays! 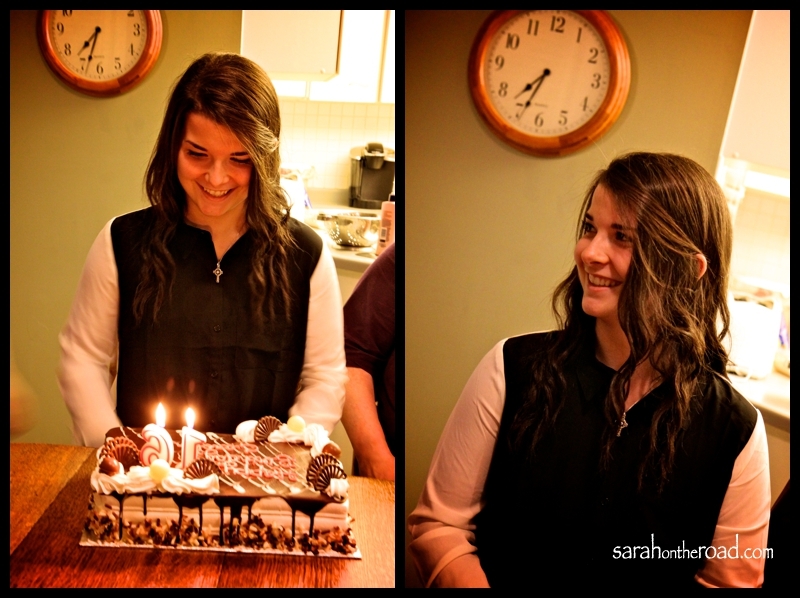 Let’s backtrack to talk about my birthday which turned out to be an awesome day. Thanks for all the well wishes! I woke up early and went shopping with Kat at my fav store downtown Toronto. I ended up getting lots of sales/deals…and some fancy new clothes…then packed up my car and headed up to my mum’s in Lindsay. We went out for dinner at a Greek place…so yummy! Mum loved the tree…my older bro & sis-in-law & nephews had come down to Lindsay a few weekends prior and went with mum to pick out the tree. 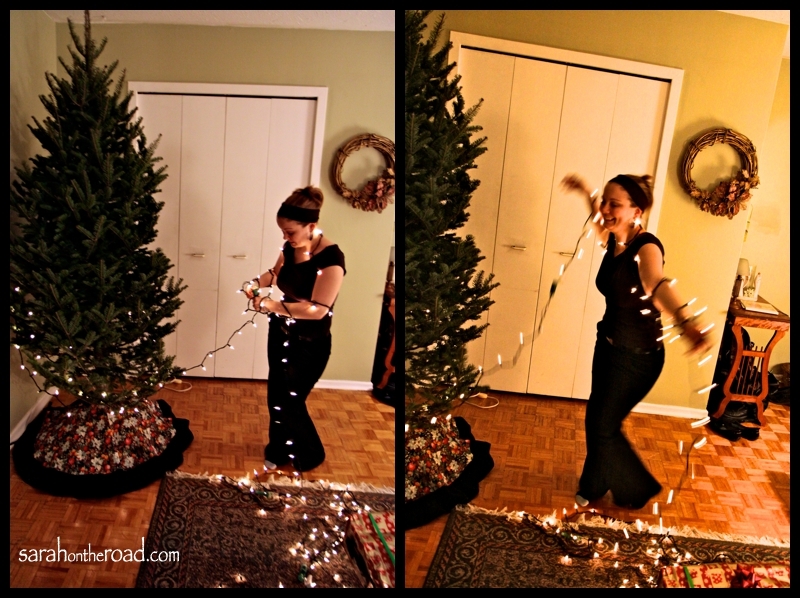 Then they stored it on the balcony…without their help I’m not sure how I would have gotten a tree to mum’s! On Saturday, I woke up and started to clean and cook! 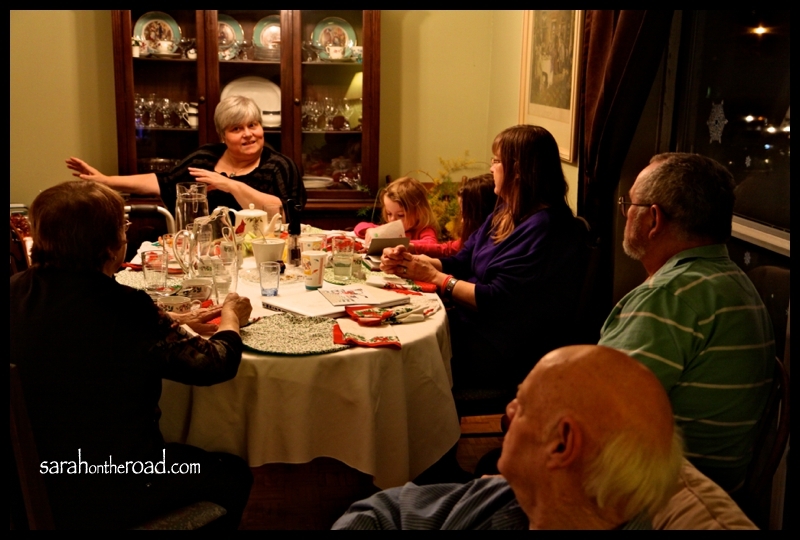 My mum and I had my gramma and Bart…and some of my mum’s first cousin’s (and their granddaughters) over for dinner. 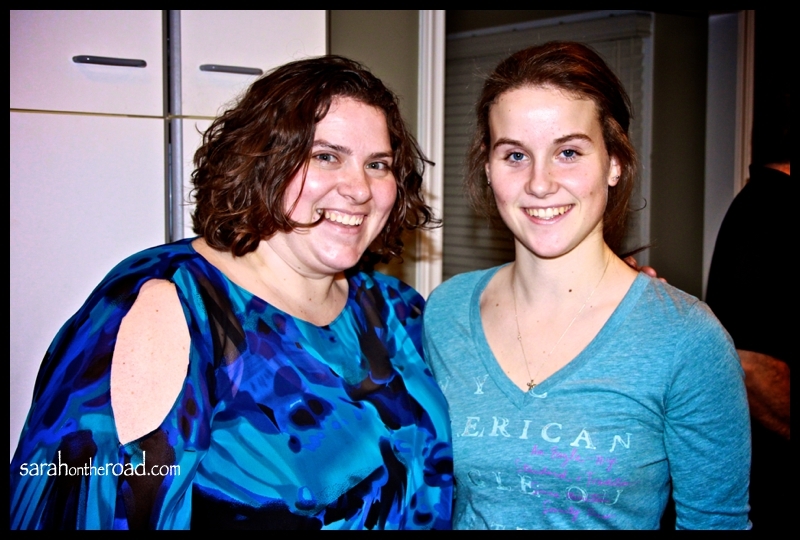 I served Char…and everyone loved it! 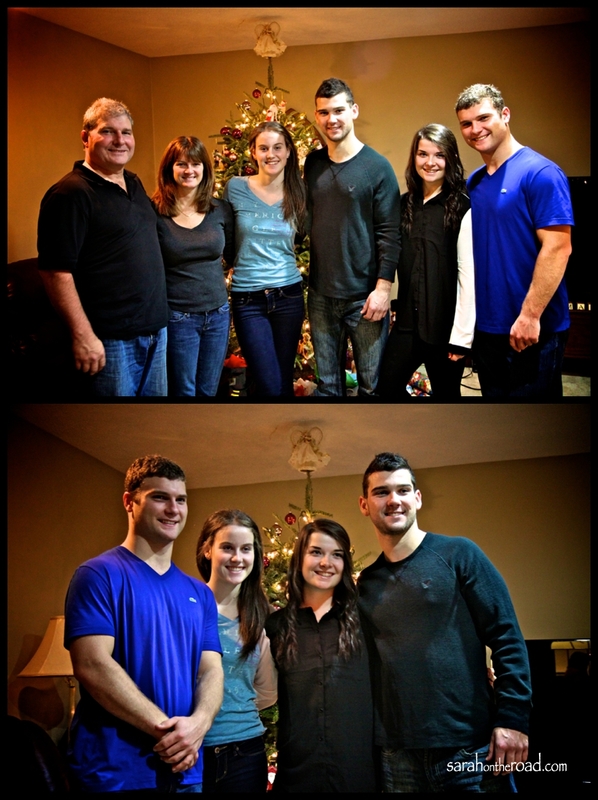 It was a lot of crazy work, but so good to see family. I didn’t bring my camera out until the end of the evening after dessert and tea! So here are a few snaps from that evening. It was great to see my Gramma (and Bart who’s hiding out of focus in this photos) again after the summer! 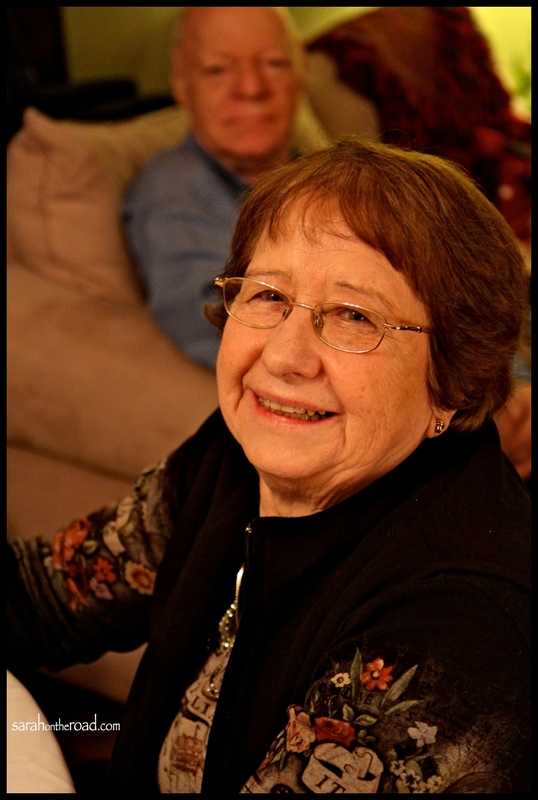 My gramma is my super-star…the coolest Grams a girl could ever have. 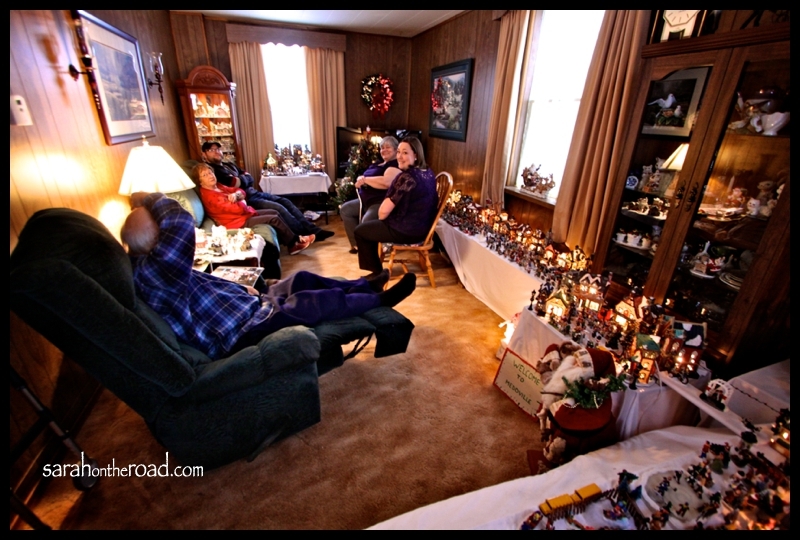 I must admit…on Monday…all the hustle, bustle of visiting and seeing friends and family finally caught up with me. Don’t get me wrong, I loved seeing everyone I saw in Toronto (and sad that I couldn’t fit in a few people…) but I was tired. This song kind of sums up what I felt like. So what did I do? 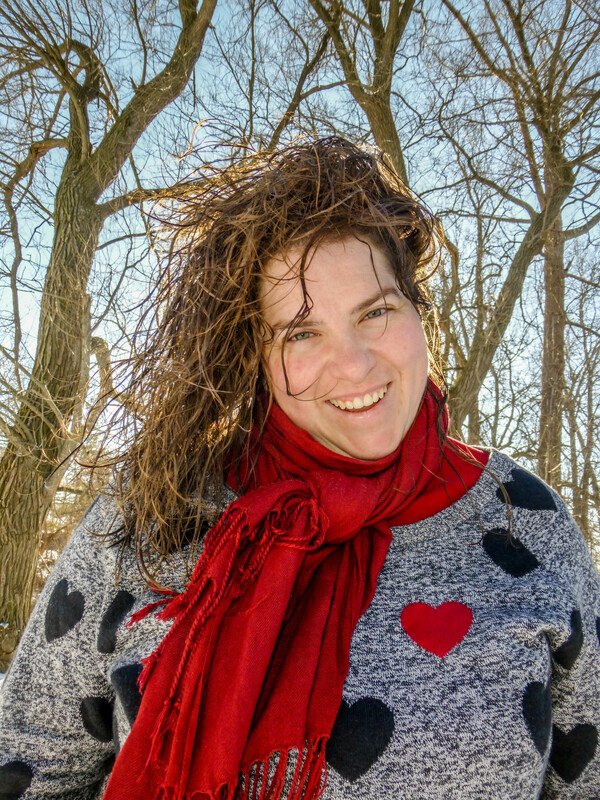 I listened to my body, I slept in, stayed in my pjs a few days…and slept! But when I wasn’t doing that…this week I also had a chance to do a bit of Christmas baking for my mum. First going out and getting all the ingredients and then working in mum’s kitchen. 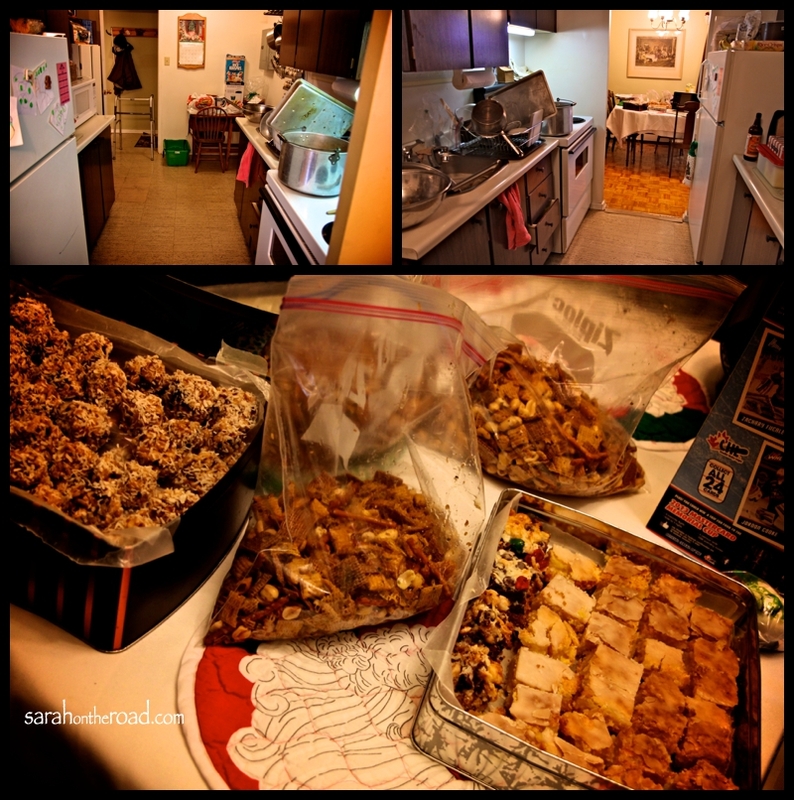 I used recipes that were passed down amongst the women in my family…and it was neat to see that I too could make those sweet treats! 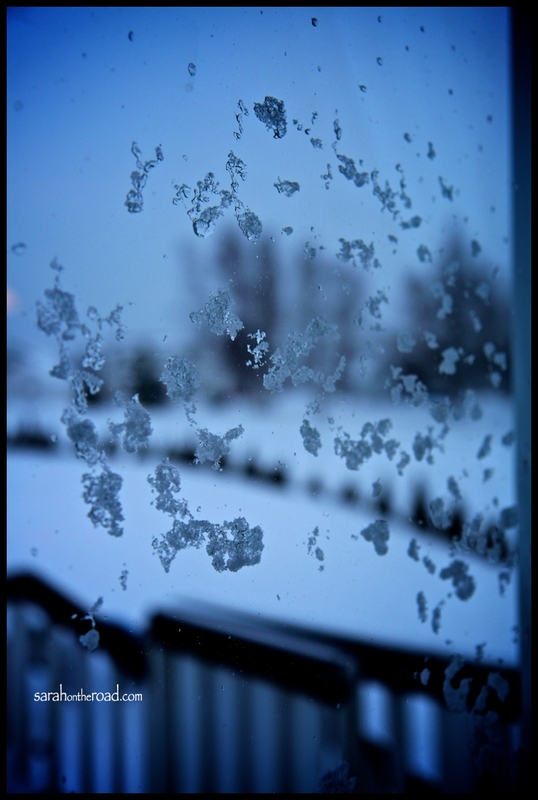 Last night the snow started to fall in Lindsay it’s starting to feel a lot more like Christmas! 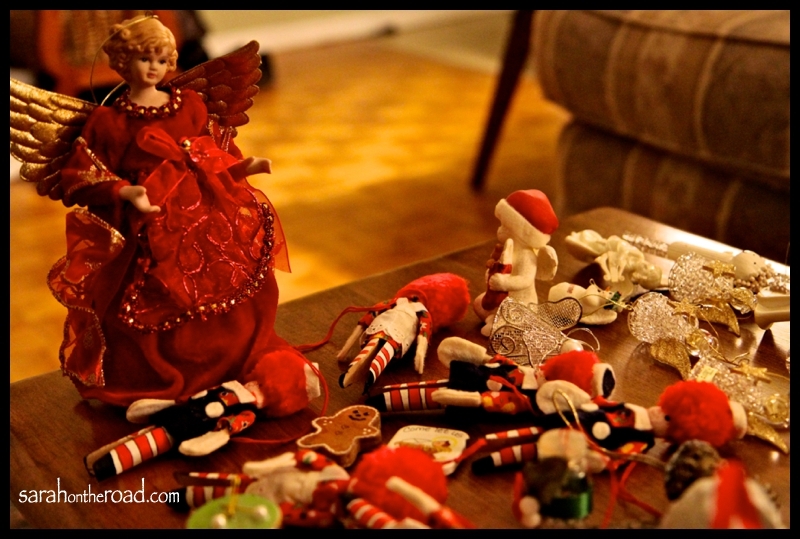 I hope you have been enjoying your Christmas prep…what is something you have to do in order to make it feel like Christmas? 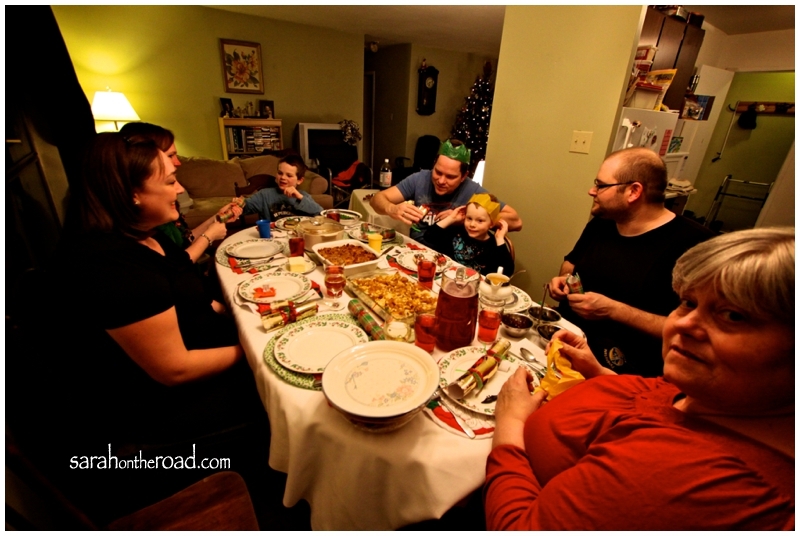 This entry was posted in Christmas, Family on December 21, 2012 by Sarah on the Road.